Before looking at the drone world in a professional or semi-professional way, many users prefer to train using a simpler, less performing and cheaper products. Whether it’s a gift for a novice child or an experiment before moving on to something more serious, starting with $50 drones could be ideal. The products offered in this guide are certainly not up to those of established brands such as DJI, but they represent a valid and inexpensive admission ticket for this world. Before buying a drone it is good to understand thoroughly your intentions and needs. If you are not an expert or have the desire to have a drone to explore new fields it is good to start with something unprofessional and therefore less expensive. A drone is always driven in the same way, so it is not a question of skill in command, but a question of necessity. The object that responds to those of a photographer or a video maker is certainly much more accessorized and expensive than that indicated for a child or an amateur. We can basically identify 3 categories of drones. 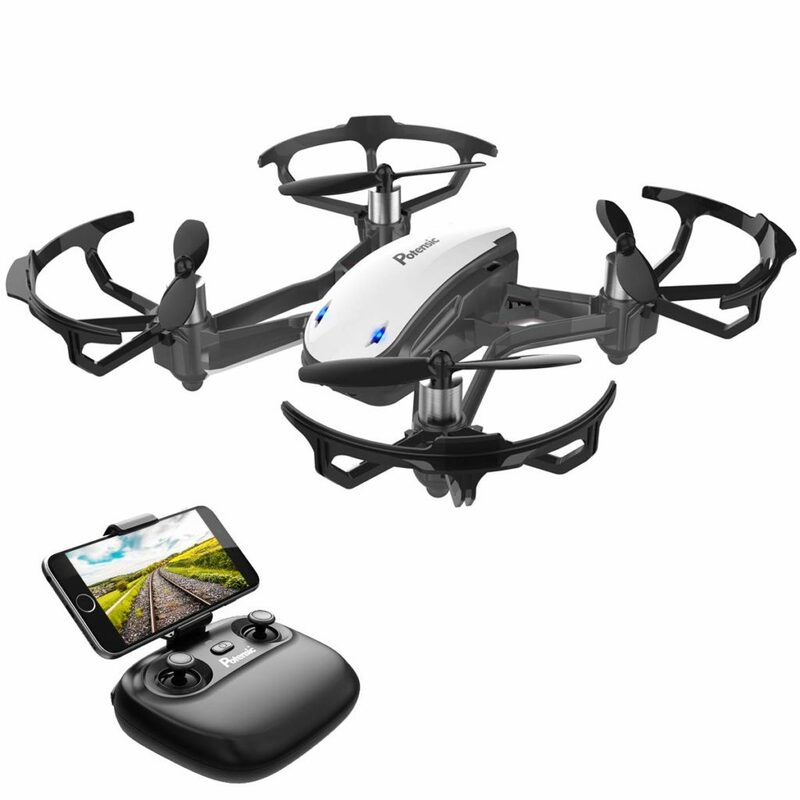 Mini drones, cheap or mid-range and professional drones. For the former we mean small drones, not very sturdy material, reduced power and usable at home or outdoors with absolutely favorable conditions and total absence of wind. The mid-range drones can be taken as a choice for those who want to start exploring the air world without being too demanding. These are discrete devices, with adequate power to their price range and capable of reaching a few meters of elevation. The professional drones instead they can move hundreds of meters away, they have a dual or triple battery (in special cases) and allow aerial shots of all respects. They are often equipped with cameras capable of taking pictures and recording 4k videos at 30fps. Build quality plays a fundamental role. Plastics are too light or thin could make the drone easy prey to sudden gusts of wind. Metal or carbon fiber structures on the other hand, ensure greater strength in flight and greater resistance in the event of a fall or impact. One of the sensors that can’t miss in drone is the most absolute way the gyroscope. It is now also present in smartphones and allows you to stabilize the device in flight. Inside the electronic module the relative position is recalculated several times per second and adjusted accordingly by the motors. Professional drones also sometimes integrate ultrasonic sensors for obstacle detection and infrared for night vision and shooting. Often overlooked because easily correctable with extra batteries, battery life must absolutely be one of the parameters to be evaluated thoroughly before making a purchase of this kind. Drones can give from 5 to 20/25 minutes of flight with an average use. But if the engines are required to make a greater effort or the aerial shot is activated, then the battery drops considerably, compromising the whole experience. Some brands require the use of proprietary batteries that are difficult to find spare parts, so it is good to observe this factor carefully. The control distance naturally varies according to the quality and quantity of technology used. On professional drones you can reach a maximum distance of more than 500m, an experience difficult to replicate on mid-range products and totally impossible if we talk about mini-drones. In fact, reach a maximum of ten meters of radius due to the small size of the antennas. After having looked at the difference between various drones and their quality, it is time to move on to the products that have passed our selection by winning the title of best drones under $50. The drone in question certainly does not claim to be the best on the market, but can give interesting sessions of leisure to those who are not looking for something professional and just want to practice in flight. The folding body is definitely a point in its favor, but the HD camera is useless. In fact, shooting with a 0.3MP sensor will be unusable. The 0.3MP camera could have been avoided in favor of a battery extension. Videos made by a sensor of this kind are absolutely useless for montages or any kind of work. The quality-price ratio for a this kind of product is absolutely undeniable, so it is certainly one of the best choices for children and amateurs considering the presence of important features such as waterproof, automatic return and the 2MP camera for shooting.